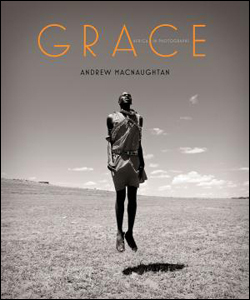 22 November 2011 - If a picture is worth a thousand words, Toronto's Andrew MacNaughtan has unleashed an important monologue on behalf of World Vision with his brand new coffee table book, Grace: Africa in Photographs. The result of a three-week sojourn to Kenya and Tanzania taken by MacNaughtan in November 2010, Grace: Africa in Photographs is a dazzling 80-page B&W portrait depiction of the people, wildlife and breathtaking beauty of one of the world’s most majestic continents. Published through his own ArtGivesHope charity (www.artgiveshope.ca) — which he established in 2006 — MacNaughtan, one of Canada’s foremost rock music photographers and video directors, is earmarking all proceeds of the limited-edition book to World Vision’s Hope Program. It sells for $55 through his website or comes free by sponsoring a child. "I hope people are inspired by my photographs to sponsor a child, but also to make that trip to Africa and see for themselves the magnificent beauty of the continent and meet the wonderful people. It will change their life, as it did mine," MacNaughtan says in the foreword to the book, written by www.samaritanmag.com’s Karen Bliss. Although the four-time JUNO Award winner solely uses his lens to capture African life, he recruited a number of his superstar friends — among them, Bryan Adams, Annie Lennox, Daniel Lanois, Céline Dion, Michael Bublé, Geddy Lee, Bruce Cockburn and Nikki Yanofsky — to choose a photo that inspired them and add their own accompanying commentary. "The future of humanity rests in the wondrous gaze of youth and the desire for knowledge," wrote Rush guitarist Alex Lifeson about his selection. "Given the opportunity, the minds behind those young eyes will create a better world for us all." In Africa, MacNaughtan personally witnessed some of the encouraging and life-saving work that World Vision sponsors and instigates in 90 countries. "We really saw the worst of the worst without World Vision onboard and then communities that have had help," he declares. "I saw the results." MacNaughtan also ended up meeting and sponsoring his own child — a vivacious seven-year-old boy named Baraka, who became the inspiration for Grace: Africa in Photographs. He hopes his book will generate 500 new child sponsors. A select number of enlarged, framed photographs from the book are on sale in different sizes and will are currently on exhibit in Toronto at the Arta Gallery in the Distillery District from November 16 to 20, 2011.